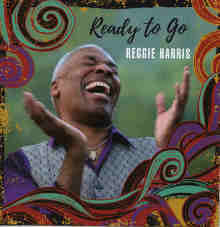 George Graham reviews Reggie Harris' "Ready to Go"
Retro music seems to be on the rise, especially with styles from the 1960s and 1970s, including the revival of British Invasion pop, Motown soul and psychedelia. Less ubiquitous but still making its presence known is a revival of Sixties style folk. The current political climate with growing protest movements has helped to give contemporary folksingers new material. Some are long-time veteran artists such as John McCutcheon, whom we featured recently on this series, and there are some younger performers emerging such as Willie Watson. As was the case in the 1960s, African American performers in the folk style are rather few and far between. In the past we had Odetta, and Richie Havens, in recent decades Vance Gilbert and Rhiannon Giddens. This week, we have a new recording by a veteran African American folk artist who after a 40-plus year career has just released his first solo album. He is Reggie Harris, and new recording is called Ready to Go. For decades, Philadelphia-native Reggie Harris was half of the duo Kim and Reggie Harris, who toured the folk festival widely and featured songs that grew out of the African American experience such as the Underground Railroad and the freedom songs. They frequently performed in educational settings from elementary schools to colleges, as well as on the coffeehouse circuit. Kim Harris after achieving her Ph.D. is now on a university faculty and not able to tour much. So Reggie Harris has continued on, and like the duo does much of his performing in educational settings. Back in 2008, Reggie Harris faced a serious illness and needed a liver transplant to survive. His experience waiting and wondering whether a liver match could be found before it was too late, inspired him in the making of this album, to celebrate his life. So though the album is full of classic-style folk protest songs, there is always positive energy in the lyrics, and especially in the music and performance which are melodic and upbeat. Harris includes several original songs, some inspired by events of the day, including the consequences of the 2016 election, and the subsequent re-emergence of hatred and bigotry, and the deaths of children by guns. He also includes a couple of traditional tunes, sometimes giving them the texture of a spiritual, and he revives songs from two of the 1960s folk icons, Bob Dylan and Phil Ochs. He is joined by a group that serves up the songs in a style than runs from folky to jazzy, and there are a couple of a cappella pieces done spiritual style. Overall, it’s an album that considers weighty issues but always sounds positive. Reggie Harris’ new release Ready to Go, his first solo album under his own name after a 40-year plus career in music performance with Kim Harris, is a first rate 21st century folk-singer record. He sings some topical and protest songs, but in the best folkie tradition, they are songs that can outlive the current circumstances, and he also brings in some history, in keeping with his educational role – he’s a lecturer and performer for the Kennedy Center’s Partners in Education program. But he puts those songs in a musically positive and appealing context, with tasteful production by a group including bassist Chico Huff, drummer Matt Scarano, guitarist Pat Wictor, who is also a folksinger in his own right, and co-production by another folky, Greg Greenway. The vocal performance is up-front with the lyrics delivered clearly and in keeping with the positive texture of the album. Our grade for sound quality is about an A-minus. The mix well-handled, there is good clarity and warmth on the acoustic instrumentation, and the vocals are unfettered by needless effects. But like so many albums these days, the misguided push to make it all artificially loud through volume compression undermined the performance and its dynamics. There are not a lot of emerging African American folksingers on the scene these days. Reggie Harris comes from a previous generation, but his new album Ready to Go is very much relevant these days, and the album is just plain appealing.